Although Telemann's Tafelmusik (Musique de table in French, literally “Table Music”, that is, music played at feasts and banquets) was issued in 1733, the Quartet in D minor is one of the pieces clearly written well before publication; in fact, it is found among the works Telemann had composed while employed in Frankfurt between 1712 and 1721. 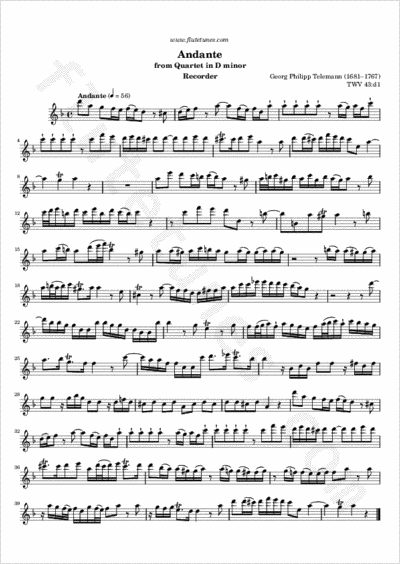 The piece was originally intended for recorder (or bassoon), two flutes and basso continuo, but it may be performed by three flutes (with an optional bass instrument) as well. The first movement, marked Andante, finds the three melody instruments entering in imitation of each other, with the bass keeping pace with a moaning figure. Before long the flutes are playing together a third apart, with the principal instrument providing a distinct but related voice. Each of the several times the main subject enters it is in imitation, followed by a free elaboration on the material with the flutes then generally performing as a unit. Thanks to Gaby for suggesting this piece!